Across Canada, UFCW Canada offers a total of 18 annual scholarships of $1,000 each to members and their family members for post-secondary studies. As a UFCW Canada Local 248P member, you, your spouse and children are eligible to apply to the UFCW Canada BDM Scholarships Program if you are attending full-time studies at a Canadian university, college, or any other recognized post-secondary institution. Five scholarships are awarded in the Western Provinces. 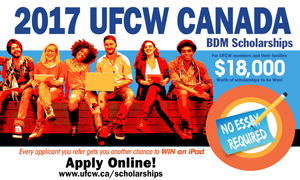 Applying for the UFCW Canada – BDM Scholarship is easy. The deadline for applying is September 30. Apply online here. UFCW SASKATCHEWAN PROVINCIAL COUNCIL – The George Semeniuk Scholarship of $1,000. Eligible to apply: Saskatchewan members, spouses and their children attending post-secondary education. Apply on line : www.ufcw.ca/saskatchewan or applications can be mailed to UFCW Canada Saskatchewan Provincial Council, 1526 Fletcher Road, Saskatoon, Sk. S7M 5M1. All application must be received by July 8, 2017.